Italy has held state mass funeral for some of the 290 people killed in August 24 powerful earthquake. Thirty-five victims from the town of Arquata were mourned at a sports hall in the regional capital, Ascoli Piceno. The death toll from the 6.2-magnitude earthquake, which struck a mountainous central region, has again risen as more bodies were found. Italian PM Matteo Renzi was among those attending the funeral along with President Sergio Mattarella, who earlier visited Amatrice, the town with the most casualties. One of the children’s coffins contained the body of Giulia Rinaldo, whose younger sister survived the earthquake because she was under Giulia’s body. One of the firefighters, Andrea, had left a moving note on Giulia Rinaldo’s coffin, apologizing for arriving too late, and signing it with a heart symbol. The coffins will be taken for burial to a cemetery near Arquata, a local official told Ansa news agency. Most of the earthquake’s victims were Italian, but several foreigners were among those killed. More aftershocks were registered in the early hours of August 27, one with a magnitude of four. The ground beneath Accumoli, another severely affected village, sank 8in as a result of the earthquake, satellite images obtained by Italy’s scientific authorities show. The district which sank is shown in red on this image compiled from data from a Japanese satellite and published by Italy’s National Institute of Geophysics and Volcanology (INGV). Flags are flying at half mast across the country as Italy remembers victims of the quake. More than 200 people died in Amatrice alone. Along with Arquata and Accumoli, Pescara del Tronto was also hard-hit. Many bodies have also been brought to a makeshift morgue in an aircraft hangar in the city of Rieti, where relatives have been identifying loved ones. The first funeral for one of the earthquake’s victims was held on August 26, for the son of a state official who died in Amatrice. At least 388 people have been treated in hospital for their injuries while more than 2,000 people were made homeless. The earthquake hit in the early hours of August 24, 65 miles north-east of Rome. Italy’s government has been criticized for failing to prevent deaths after the 2009 earthquake in nearby L’Aquila left 300 dead. Historic towns do not have to conform to anti-quake building regulations, which are also often not applied when new buildings are put up. In addition to emergency funds, Prime Minister Matteo Renzi canceled taxes for residents and announced a new initiative, “Italian Homes”, to tackle criticism over shoddy construction. 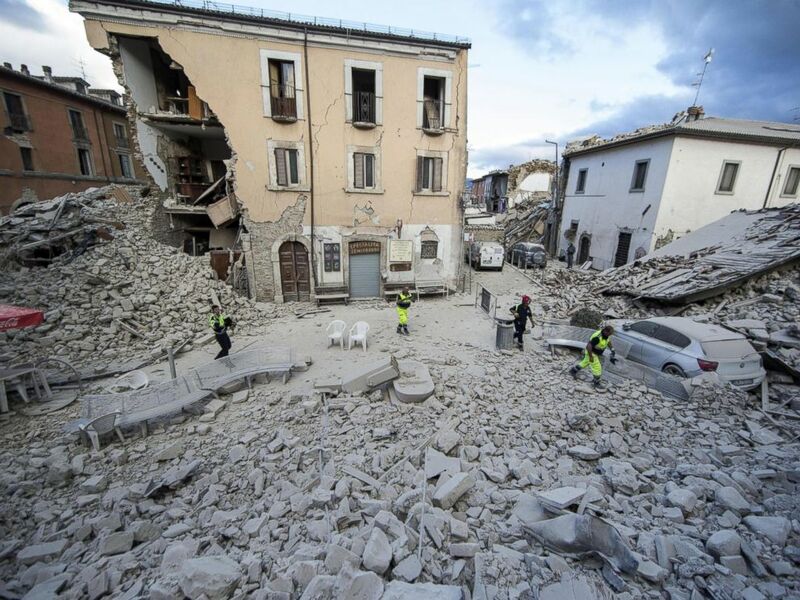 Matteo Renzi also said that it was “absurd” to think that Italy could build completely quake-proof buildings.